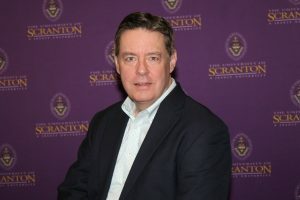 University of Scranton accounting professor Douglas M. Boyle, D.B.A., was profiled as one of just six “Professors to Know in Business Programs Based in the Northeast” selected by Bschools.org, an online resource for entrepreneurs. The professors, who teach at business schools in the Northeast with online MBA programs, were selected based on their professional experience and knowledge. An award-winning researcher and teacher, Dr. Boyle is chair of the University’s Accounting Department, director of the University’s DBA program and the founder and director of the University’s Nonprofit Leadership Certificate Program. A Certified Public Accountant as well as a Certified Management Accountant, Dr. Boyle has more than 25 years of industry executive experience. He has served in executive roles in startup, middle market and Fortune 500 companies where he has held the positions of chief executive officer, president, chief operations officer and chief financial officer. He currently serves as chair of Allied Services Foundation’s Board of Directors. Dr. Boyle earned his bachelor’s degree from The University of Scranton, a MBA from Columbia University and a doctorate from Kennesaw State University. 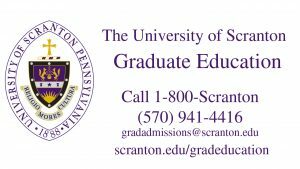 To learn more about the DBA program at The University of Scranton, click here! 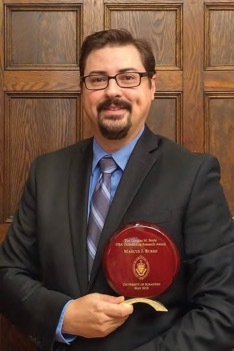 At The University of Scranton’s Kania School of Management Annual Accounting Dinner on May 3, 2018, Doctorate of Business Administration (DBA) student Marcus Burke received the first ever Dr. Douglas M. Boyle DBA Outstanding Research Award recognizing his exceptional research efforts with University of Scranton Accounting faculty. Burke, who holds a Bachelor’s degree in Music Composition from Old Dominion University and Master’s degree in Management from Texas A&M University-Commerce (TAMUC), began pursuing his DBA at The University of Scranton in August 2017 as a member of the program’s flagship cohort. Prior to returning for his terminal degree, Burke gained professional experience at CMA CGM (America) LLC as a Database Administrator and Web Application Developer before being promoted to a Business Architect, TAMUC as a Senior Web Developer, and TAMUC and Marist College as an adjunct faculty member teaching in the areas of Accounting Information Systems, Systems Analysis and Design, Data Information and Management, and Enterprise Resource Planning. During his first year in the DBA program, Burke completed and submitted a research article with Drs. Douglas M. Boyle and Daniel P. Mahoney to Management Accounting Quarterly entitled “Goodwill Accounting: The Matter of Serial Non-Impairment.” This research uses thirteen years of archival data covering 1,646 firms from Compustat and Thompson ONE to examine the number of firm acquisitions and their respective goodwill impairment rates to determine the existence of notable trends related to the non-impairment of goodwill among firms with high business combination rates. Burke has also co-authored a case with Drs. Megan Burke and Sandra Gates entitled “To Amend or Not to Amend: A Tax Consulting Case” which appears in the Journal of Accounting Education (2017). Currently, he is working with Dr. Megan Burke on research related to managerial ability and its relation to a firm’s tax posture, and with Drs. Sandra Gates and Megan Burke on an article for the Accounting History Review on Benjamin Montgomery and the role of slavery on the development of American accounting. Burke, originally from Virginia Beach, Virginia, currently lives in Poughkeepsie, New York, with his wife, Megan, an accounting professor a Marist College, and his two children, Justin and Evelyn. He continues to enjoy playing music and playing taxi driver for his children’s extracurricular activities. To learn more about the DBA program at The University of Scranton, click here. 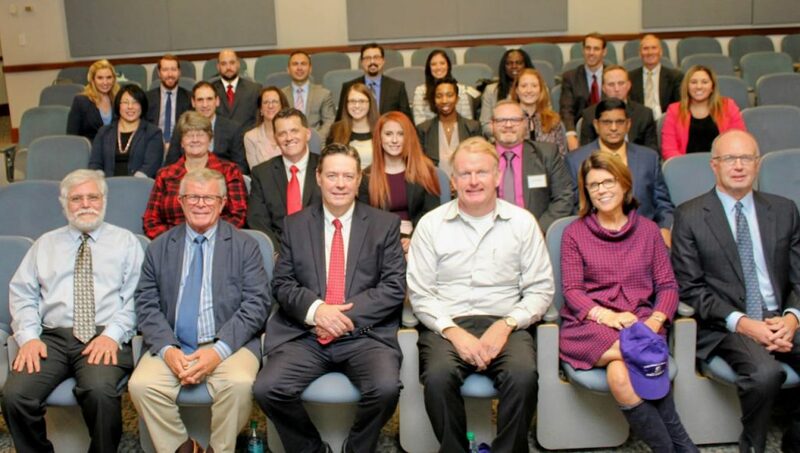 The University of Scranton welcomed the second cohort of students into its doctor of business administration (DBA) program. Douglas M. Boyle, DBA, associate professor, Accounting Department chair and DBA program director, faculty from the DBA program, University Trustees and DBA students who entered the program in the fall of last year, joined together to help orient the new students into the program at a welcome session on campus. Housed in the University’s Kania School of Management, the DBA program began in the fall semester of 2017. The University’s DBA program, with a concentration in accounting, was developed to provide experienced practitioners with a practical pathway to an academic career. The program offers participants flexibility, while still providing for the development of the knowledge and skill set necessary to become a “scholarly academic” – one who is qualified to teach at a school of business that possesses or is seeking formal accreditation by Association to Advance Collegiate Schools of Business (AACSB International). James W. Sunday of Scranton. Click here to learn more about the DBA program at The University of Scranton! Kania School of Management – Meet our new Dean! Robert S Weiss on Awesome Rankings for MAcc program!